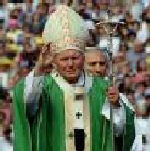 Pope John Paul ll died on April 2nd, 2005 at 9:37 PM Vatican Time. I think he had been fighting death for a long time. I believe he felt very strongly that the world needed him and his presence. Though we do not know the day or the hour that our time on earth will end, I have known of people that had enough determination and fight to delay the inevitable. This Pope had been in this office for over 25 years. Over the last few years, when I have seen him on television, I saw the same tired, weakend look in his continence that I saw in my own father's just before his death. As Christians, no matter what your heritage or denomination's rules state, you have to admire this man for his conviction, his drive, his accomplishments and his faithfulness. He was the only head of the Roman Catholic Church that was humble enough to apologize for it's sin and inequities against Jews, non-Catholics, Blacks and other races that were affected and persecuted by over-zealous Church members. He prayed at the Wailing Wall and left a message there. He prayed in Synagogues. As a young priest in Communist Poland, he secretly held Mass for some of the youth of Poland by taking them on hiking trips and setting up an alter in the front end of a row boat. Recently he was very concerned about the serious sexual inequities committed by American clergy and the impact on the innocent victims. Let us not forget that a mere twenty-five years ago about the prevalence of Communism in the world and it's threat to the free world. One of Pope John Paul ll's most important triumphs was his influence and work towards the inhalation of Communism in his native land, Poland. Besides the being the Bishop of the Roman Diocese, certain other dignities are held by the pope as well as the supreme and universal pastorate: he is Archbishop of the Roman Province, Primate of Italy and the adjacent islands, and sole Patriarch of the Western Church. The Church's doctrine as to the pope was authoritatively declared in the Vatican Council in the Constitution "Pastor Aeternus". There are some scriptural basis for this title and position, though these are not recognized by most Protestant denominations. In Matthew 16:17-19, the office is solemnly promised to the Apostle Peter. In response to his profession of faith in the Divine Nature of his Master, Christ thus addresses him:. "Blessed art thou, Simon Bar-Jona: because flesh and blood hath not revealed it to thee, but my Father who is in heaven. And I say to thee: That thou art Peter; and upon this rock I will build my church, and the gates of hell shall not prevail against it. And I will give to thee the keys of the kingdom of heaven. And whatsoever thou shalt bind on earth it shall be bound also in heaven: and whatsoever thou shalt loose on earth, it shall be loosed also in heaven." The prerogatives here promised are manifestly personal to Peter. His profession of faith was not made as has been sometimes asserted, in the name of the other Apostles. This is evident from the words of Christ. He pronounces on the Apostle, distinguishing him by his name Simon son of John, a peculiar and personal blessing, declaring that his knowledge regarding the Divine Sonship sprang from a special revelation granted to him by the Father (cf. Matthew 11:27). He further proceeds to recompense this confession of His Divinity by bestowing upon him a reward proper to himself: "Thou art Peter [Cepha, transliterated also Kipha] and upon this rock [Cepha] I will build my Church." The word for Peter and for rock in the original Aramaic is one and the same; this renders it evident that the various attempts to explain the term "rock" as having reference not to Peter himself but to something else are misinterpretations. It is Peter who is the rock of the Church. The term ecclesia (ekklesia) here employed is the Greek rendering of the Hebrew qahal, the name which denoted the Hebrew nation. Without a long dissertation on church and papal history or even the history of Rome, let us just say that when man becomes involved, when man does not listen to or study the Word of God then things fall apart. We not only broke off into Catholics and Protestants, but into Roman Catholics, Byzantine Catholics, Greek Catholics, Ethiopian Catholics and many, many Protestant denominations. Whatever your views are, if you are reflecting on the passing of this man you have to admit that he made the world a better place during his brief time here. What more can a man ask?